Suprisingly, DC Storm Tag Manager outperformed other two. This is due to the fact that I gave more importance to the Tag Libraries and Templates in the analysis in which DC has outperformed others. As an implementation specialist or end user you might use other features of TMS more than tag templates. In that case GTM may outperform the other two. So, at the end of the day, the choice of tool is entirely depended upon your requirements :) Feel free to tell your experiences with Free TMS tools in the comments below. Greetings from viewthrough.org - this is pretty handy thanks for sharing it. Another area to compare these might be data leakage risk or data security more for large or mid-size enterprises thinking they can get away on the cheap. GTM is not really free when you are sharing customer/prospect data that in the end has to feed G's data mining engines to support the ad targeting model. I don't know of any reason to think that Google does this - they've gone on record many times promising that their GA data isn't used by them for commercial purposes, no reason to think their GTM data is used for this either. 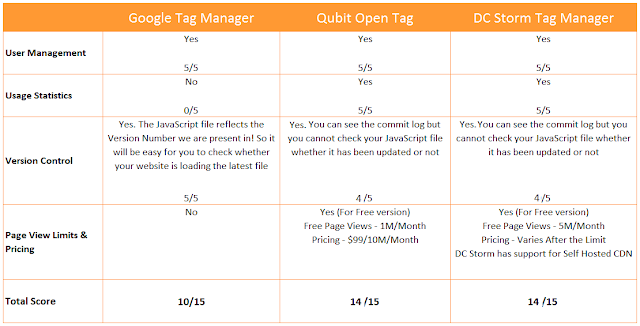 A more powerful free tag manager is offered by Mezzobit (www.mezzobit.com), and it's free as a SaaS solution for websites of any size. Google Tag Manager is a very limited offering, with poor support for synchronous and visual tags, as well as only a handful of tags in its partner library. Finally, the Mezzobit solution also offers a growth path beyond free tag management into management of data leakage, privacy policies, A/B testing, and mobile data collection.